Jerry Wayne Poffenbarger of Livingston is tended by emergency personnel. Poffenbarger was driving the car (pictured) and slammed another vehicle from behind on US-190 West. 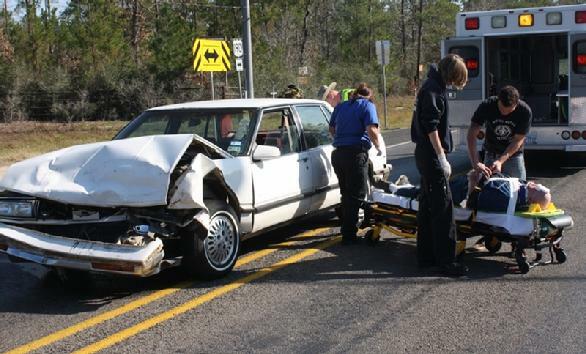 Accident Sends 2 to Hospital, LIVINGSTON, January 5, 2012 - Shortly after 1 pm on January 5, 2012 a silver 2000 Pontiac Bonneville driven by Henry Grebe, Jr., 84, of Livingston, was west-bound on US-190 West. Grebe had stopped and was waiting to make a left turn onto FM-3126 when he was slammed from behind by a white Oldsmobile Eighty Eight driven by Jerry Wayne Poffenbarger, 74, also of Livingston. 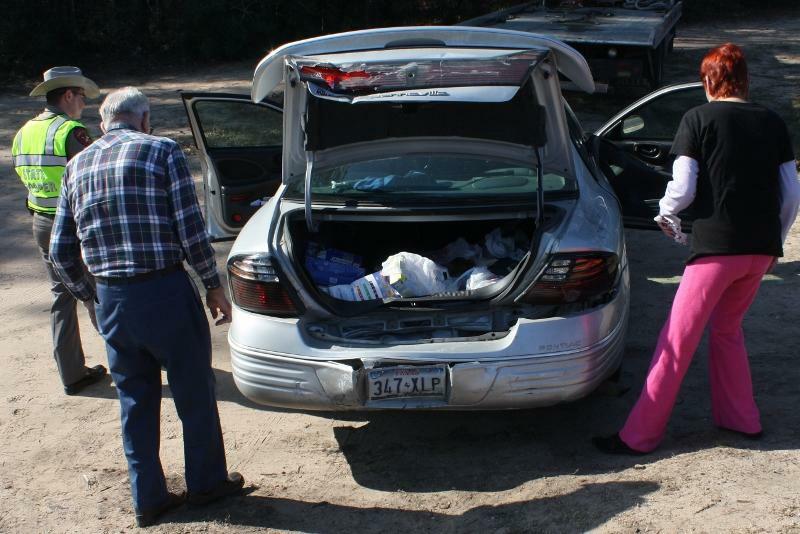 The collision totaled Poffenbarger's vehicle and knocked Grebe's car onto the grass off the east-bound side of 190. Americare Ambulance Service was dispatched to the scene along with Deputy Craig Taylor with the Polk County Sheriff's Office and Troopers Darwon Evans, Donny Akers, and Joe Cole (all with the Texas Highway Patrol). 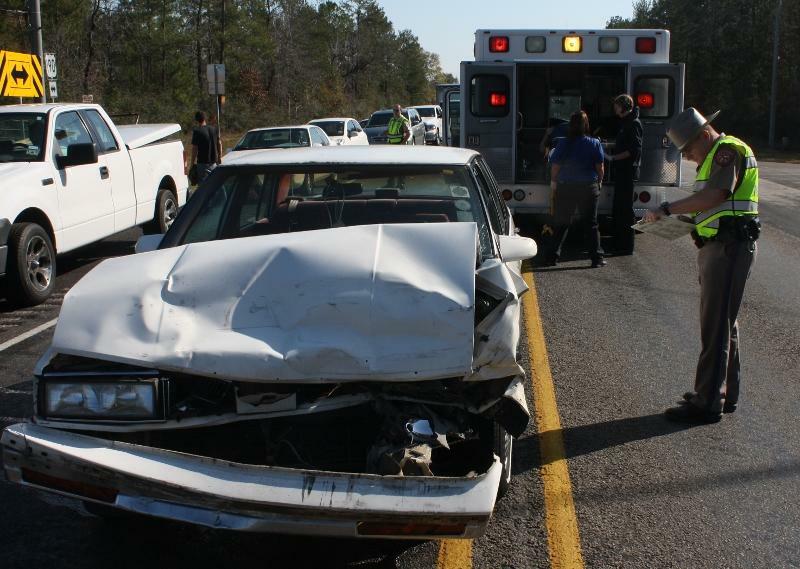 Poffenbarger was treated at the scene by Americare Ambulance Service and transported to Livingston Memorial Hospital as Charles Grebe's passenger, 65 year old Nelda Fowler. Traffic was partially blocked during investigation and cleanup. Jerry Wayne Poffenbarger was cited for failure to control speed. Both parties had insurance. A rollback wrecker from Ken's Towing recovered Grebe's vehicle and it will be stored at Harrison Body Shop while Poffenbarger's vehicle was recovered by George White & Sons and will be stored in Onalaska. The scene was cleared by 2 pm. Trooper Donny Akers (pictured) was one of 3 Troopers at the scene. Poffenbarger slammed this 2000 Pontiac Bonneville from behind (driven by Charles Grebe, Jr.,pictured at left). 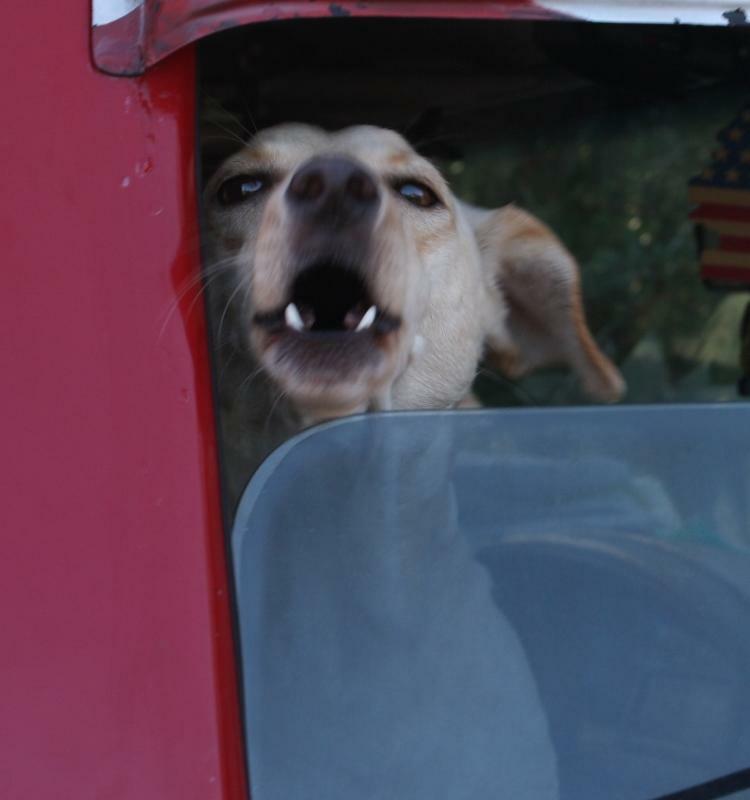 Houdini watches the action from his truck. 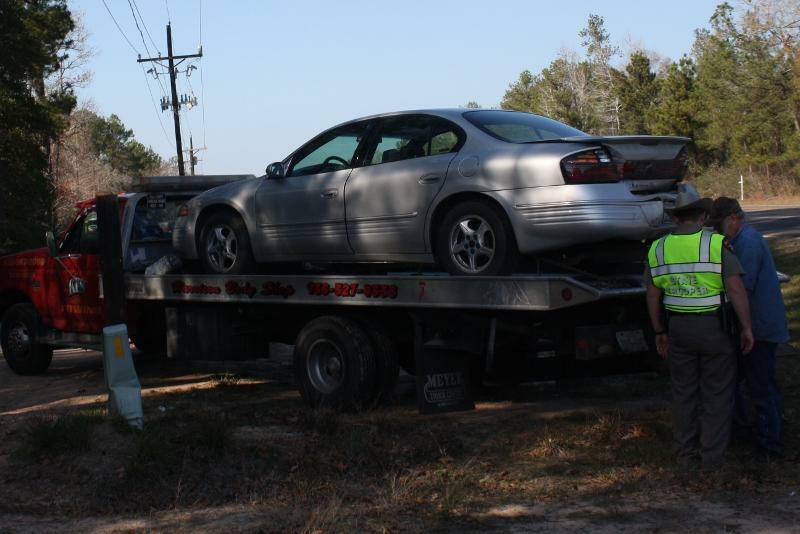 Grebe's vehicle was recovered by Ken's Towing. 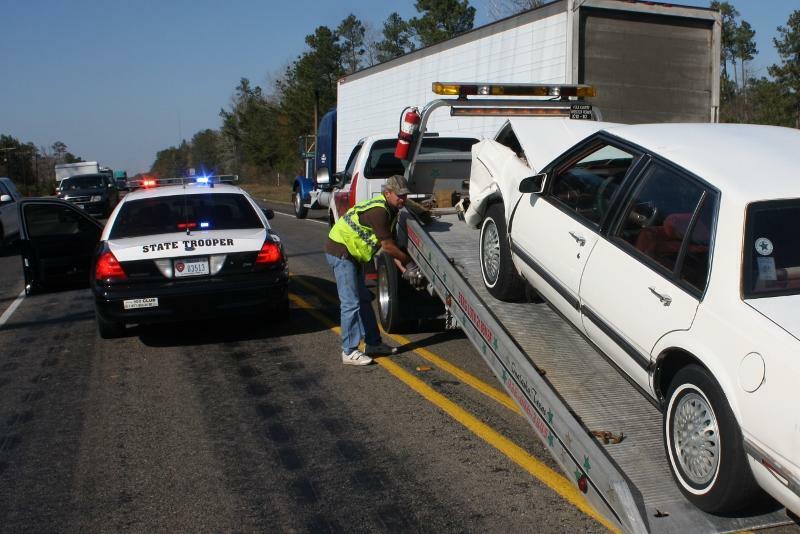 Poffenbarger's vehicle was recovered by George White & Sons Wrecker Service.